The following notes are based on the knowledge that two captains in very early matches remain unknown. England have been led by 121 captains in the 993 matches they have played since the first in 1872. The list is headed by the incomparable Billy Wright and Bobby Moore, who each led England 90 times, still a world record. Wright served as captain in 70 consecutive England matches during the 1950's, an almost unbelievable record that was eventually broken by Heinz Hermann of Switzerland (71 captaincies in a row 1982-89), and then Andoni Zubizaretta of Spain. A record that seemed unbreakable in an era in which the physical demands of the game are much higher and even the slightest injury keeps players costing millions of pounds out of action. Bryan Robson, who led England 65 times, David Beckham, Wright and Moore are the only players to lead England more than 40 times. Robson probably would have challenged the Wright/Moore record of 90 captaincies but for his relentlessly aggressive style of play, which led to several serious injuries reducing his international appearances. The captaincy was not assigned to one player for an appreciable number of matches until professionalism began to take a grip on the national side in the 1880's and 1890's. Before that it was merely regarded as an honour with ceremonial attributes to be passed around to deserving players, a concept that continued to carry weight into the inter-war era when the Football Association's International Selection Committee continued to choose the lineups and the captain. Indeed, that notion has occasionally carried lingering force in modern times when players have been given the captaincy for a single match in recognition of long service or a milestone in career caps. Thus David Seaman was made captain for the match marking his 50th appearance, and Bobby Charlton led out the team for his 100th cap although the regular England captain at the time, Bobby Moore, was also in the lineup (albeit Charlton also captained England on two other occasions when Moore was absent). But in the post-Second World War era, the captaincy generally has been assigned by the manager/coach to a single player who remained in that role until until his international careers waned or ended or until a new manager/coach brought in a new captain. In modern times, the manager/coach usually also picks a vice-captain, who leads the team when the regular captain is absent through injury or suspension. Michael Owen had led the team Sven-Göran Eriksson's first-choice captain, David Beckham, has been absent. In the Steve McClaren era, Steven Gerrard deputised for John Terry. As for the Capello era, Rio Ferdinand deputised for John Terry, that was until Rio himself became the National side's captain, to be deputised by Steven Gerrard. While the England captaincy still is regarded as a great honour and carries the traditional ceremonial aspects--leading the players onto the pitch, introducing the players to match dignitaries, exchanging emblems with the visiting team's captain, attending the referee's coin toss which settles direction of play and which team kicks off at the beginning of a match--it involves much more than that. The captain is expected to exercise leadership both on and off the pitch--to serve as a public spokesman for the team, to provide a communication link between the players and the staff, and to take charge of the team during a match, rallying and inspiring the team when it is down, exercising a calming influence when tempers are frayed, encouraging young players inexperienced at international level, correcting errant players and the like. Still, England football captains generally do not have much influence on team selection, formation or tactical decisions, although some of them have gained their manager's ear by dint of a long working relationship, most notably Bobby Moore under Alf Ramsey. Only players who started a match as captain are recognised as official England captains. Players who took over the captain's armband during a match when the starting captain had to leave the pitch because of injury or, in modern times, because of substitution are not listed as captains in the Football Association's official records. In fact, it has said it does not even keep records of those temporary armband wearers. We know of numerous instances in which more than two players wore the captain's armband in the same match. Most certianly the first occasion was the scoreless draw against Morocco at Estadio Tecnológico in Monterrey, Mexico on 6 June 1986. Bryan Robson of Manchester United was the starting captain in this World Cup final tournament match. He went off injured and the armband went to Ray Wilkins, then of AC Milan. 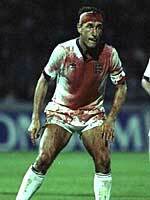 Wilkins was sent off soon after, and Peter Shilton of Southampton FC then took the armband. The following occasion was the 2-1 friendly match against Serbia and Montenegro at Walkers Stadium in Leicester on 3 June 2003, when four players wore the captain's armband, including three Liverpool players. There was widespread dismay in the media and among some former England stars that three players deemed undeserving of the captaincy--Emile Heskey of Liverpool, Phil Neville of Manchester United and Jamie Carragher of Liverpool--were handed the captain's armband as a result of the spate of substitutions that followed the half-time retirement of Liverpool's Michael Owen, who had started the match as captain in the absence of regular captain David Beckham. Only Owen will be listed as captain in the official match records, however. The three who took over the armband were merely its temporary custodians, and are not entitled to official recognition as England captains, and hence the outrage was somewhat over the top. Owen was the 104th official captain. He first led the side in three preparatory friendly matches just before World Cup 2002 while Beckham recovered from a broken foot. Owen captained England again in the season-opening friendly against Portugal on 7 September 2002, and in the pair of matches that ended the season, the friendly against Serbia and Montenegro on 3 June 2003 and the European Championship 2004 qualifier against Slovakia a week later. Steven Gerrard became the 105th official England captain on 31 March 2004, in a friendly celebrating Sweden's centenary. It was in the absence of regular first choice captain, David Beckham, and second-choice captain, Michael Owen, who were both injured and unfit for this match. John Terry was chosen by Steve McClaren as the 106th captain, following David Beckham's resignation, with Steve Gerrard on stand-by should Terry be unfit to play. It was Steven Gerrard who became Fabio Capello's first captain in his first match in charge. Capello announced that John Terry too, would be his official captain in September 2008. Rio Ferdinand had already become England's 107th known official captain in Capello's search for a captain, Ferdinand in turn, became the vice-captain to Terry in the Capello era. It was on the middle-east heat, in the deserts of Qatar, that saw Wayne Rooney become the third youngest post-war captain, and the 108th known captain. John Terry had been ruled out of the Brazil friendly match in the night before the match and Rio Ferdinand and Steven Gerrard had already been excluded from the initial squad due to an injuries. David Beckham had withdrawn himself from the squad a week earlier due to club commitments. Capello saw Rooney as the next natural leader. Towards the end of 2009, the role of the Captaincy was under scrutiny after John Terry was named and shamed in the media regarding his off-the-field antics. Although within the modern morality of society, this as hardly a sin of any proportion, but the fact the allegations concerned an England team-mate left his position as a national role model untenable. It was reasonable to suggest that no Manchester City player, the current club of Wayne Bridge, would ever see JT as their leader. That made Capello make a decision in the best interest of the national game, and vice-captain Rio Ferdinand, became England's next current captain. Steven Gerrard becoming the vice-Captain. A role that become vital throughout the 2010 World Cup Finals, where Gerrard took the armband as his own, with Frank Lampard becoming his vice. At the beginning of 2011, with both Ferdinand and Gerrard unavailable to take the armband through injury, Frank Lampard became England's 109th known different captain, against Denmark. In March the same year, in the match against Ghana at the new National Stadium, Gareth Barry became the 110th known England Captain, the 47th post-war. All of this catapulted Capello's decision-making process into the limelight. The very fact that Capello reinstated John Terry in March 2011 to the captaincy position, without informing Ferdinand, but informing Gerrard, then three days later, handing the armband to Barry. The Captain's role is never an easy one, and neither is the decision to make it so. It was the Captain's armband that eventually cost Fabio Capello his position as England manager. The Football Association felt it necessary to strip John Terry of the captaincy for the second time in his career, as he awaited trial for alleged racism. Capello disagreed at some point, whether at his own non-involvement in the decision-making process, or with the decision itself, only a future auto-biography will tell. Up stepped Capello's number two, Stuart Pearce, who, despite the fitness of Steven Gerrard, chose an untested Scott Parker, winning only his eleventh appearance, in the match against the Netherlands in February 2012. Gerrard, however, was finally chosen as the national team captain after Roy Hodgson was appointed as England's thirteenth manager in May 2012. Hodgson also made Frank Lampard his vice-Captain. However, in May 2013, the media's perception of the Captaincy was thrown into disarray when Hodgson announced that he would signify Ashley Cole's century of appearances for the national team by handing him the armband. The 49th post-war captaincy. The debacle was because that acknowledgement came on Cole's 102nd appearance, against the Republic of Ireland, and because Cole was only going to be taking the role of leading his country out of the Wembley Stadium player's tunnel. It was already decided that Lampard was to fulfill the normal off-field role of captain. Following the 2014 World Cup Finals, both Steven Gerrard and Frank Lampard retired from international football, leaving the pathway open for the most experienced player on the field to take the armband. Step forward, Wayne Rooney. Gary Cahill was appointed as his vice-captain. After a full season with Rooney in charge, there were four different captains in the first five matches of 2015-16. Rooney in charge of the first two, then Gary Cahill earning his first honour, and the fiftieth to do so since the war, when Rooney was injured. Then, on 12 October, when both an injured Rooney and a rested Cahill missed the match against Lithuania, the captaincy was handed to Phil Jagielka. The first Everton player to receive the honour. The following month, when Rooney and Cahill were rested against Spain, and Jagielka was injured, the job fell to the most experienced player on the pitch, Joe Hart. For the second match in 2016, against Netherlands. With Rooney and Hart injured, Cahill rested, it was left to the most experienced member of the squad to take the armband, step forward, James MIlner. The record was completed in the friendly match against Australia in May 2016. Not only had Hodgson now used a record six different Captains in one season, but he used nine since he became manager, equalling the number used by Ron Greenwood. When Sam Allardyce was appointed in July 2016, he re-appointed Rooney as his captain a month later. After Allardyce was unceremoniously sacked, the under-21 manager, Gareth Southgate, took over the reigns, firstly on an interim basis, then permanently. He kept Rooney as his captain but dropped him for his second match against Slovenia. Liverpool captain Jordan Henderson slipping on the armband. Followed by Gary Cahill and then Joe Hart. Making four captains in his first six matches. Not so much a declining trend, but Southgate's attempt to put more leaders on the field. When Rooney was dropped at Southgate's first season-end, Harry Kane, still only 23, and still with only seventeen appearances, was awarded the armband against Scotland and France in June 2017. Indeed, following Rooney's retirement from international football at the beginning of the 2017-18 season, the mantel was unofficially taken up by Jordan Henderson and Harry Kane. Kane, despite drawing his first and losing his second match, became the first player to take the armband and score in his first four matches doing so. Southgate chose his sixth different captain at the end of 2017 when Eric Dier became the second youngest captain to take the armband at Wembley. His seventh captain, when both Dier and Kane were rested, came in November 2018, when Fabian Delph became the 121st known captain to take the armband.